They’re called Kingmakers. That silent hand, guiding the masters of their domain, elevating their image, quelling fires, and filling the gaps. Game of Throne’s Cerci Lannister, DNC Chairman and former Chicago Mayor Richard Daley, or Chicago Tribune Political Writer David Axelrod, the Kingmaker takes many forms. Be it actual control from the shadows, or setting the stage for success, a kingmaker is bound by no responsibility but success. For all the accolades LeBron James duly receives, don’t forget the one who made it all possible. LeBron’s kingmaker is none other than David Griffin. When James returned to Cleveland he made it clear: this would be a longer process than in 2010. With young players Kyrie Irving, Dion Waiters, and newly picked Andrew Wiggins, James joined one of the NBA’s youngest cores. This core wasn’t unproven per say, Cleveland was only a few wins away from making playoffs just the season before, and LeBron James alone uplifts an unreasonable amount (currently, Cleveland plays 20 points better per 100 possession when James is on the court), but already aging past his supposed prime, newly anointed General Manager David Griffin had other plans for his star. Calling on previously successful models, Griffin seemed to alter Cleveland into a cup noodle contender, instant championship; just add water. However, there were a number of steps David Griffin took to show the intricacies of his decisions. Cleveland needed to pair James with a second star. Extending Irving’s contract clearly impacted James’ decision to return home as the former Duke standout would be the most talented player James ever had on a Cleveland roster. Taking a spin on a rookie, especially one that shared position with James, to be Cleveland’s third option however, was a risk Griffin wouldn’t take. Rather, Griffin would turn to Miami’s championship recipe for inspiration. The Miami championship core consisted of four parts; LeBron James, a scoring guard in Dwayne Wade, a stretch four in Chris Bosh and veteran sharpshooter in Ray Allen. Griffin could already check boxes regarding James himself, and Irving provided a similar presence to Wade with his handles. What he was missing was a stretch four and a sharpshooter. Luckily for him, a disgruntled Kevin Love demanded a timely trade. Flipping a first round pick for a superstar is the ultimate “win-now” move, and win now moves come with substantial risk. Just ask the Philadelphia 76ers who offered two firsts, Nerlens Noel, and Robert Covington for Paul George’s expiring contract. There was no guarantee he wouldn’t dash for the Lakers or the Celtics as his contract expired, and there was no guarantee Kevin Love would stay after that first year in Cleveland. LeBron James marks one of the few times such a gamble is not only acceptable, but necessary. Griffin recognized James’ championship window is tapering off. Even playing the best basketball of his career at 32, there’s only so long a players body can hold out at an elite level. Rather than crafting for the future, Griffin maximized the present. Though acquiring Love was impressive, only so much merit can be granted to a General Manager which acquired a superstar when the timing was right, and the pieces are there. When building that first roster, Griffin rather should be championed on his smart supporting cast acquisition. Just as important as talent in crafting a team is intelligence and basketball IQ. Knowing where to be on the court, and how to interact with a system can make or break championship contenders, and Griffin found the perfect foils to do just that. Only adding three major pieces outside of the big three, Griffin prioritized veterans with game knowledge rather than youth with athleticism. Adding players such as James Jones, Mike Miller and most importantly Shawn Marion brought additional leadership to the locker room, but also speeding up the process of integrating a system. Veterans know how to play, they’ve played in a system before and generally they show willingness to be complimentary rather than primary options in a system. What’s important then is creating a system that moulds and is conducive to your primary options skill-set. LeBron James is the greatest passer basketball has seen since Magic Johnson. His court vision is unparalleled in this generation, making a pass first system gel perfectly with the game he’s attempting to play. So rather than hire a scoring shooting coach like Mike Diantoni or a traditionalist like Van Gundy (either one take your pick), Griffin sought out a coach from a background that encouraged team ball. This led him to the mother of all team ball leagues, the Euroleague. Looking back, David Blatt’s hiring is seen with some scrutiny. Would an NBA rookie coach, even one with such a pedigree as Blatt, transfer over to the NBA in such a short time? Wouldn’t he face the same struggles a college to NBA coach would? And to be fair, Blatt did face these issues. But in creating a system which applied the slow, calculated pace of Euroball with the pass first nature of a Greg Popovich style, Blatt laid the groundwork for what an aged LeBron James might thrive in. All credit to Tyronn Lue, he was clearly set to become a head coach, his time with the Celtics, and salary higher than any other assistant alone should have indicated that, but Lue perfected the system Blatt pioneered. Blatt’s system, and in this sense Griffin’s idea was simple, rather than push pace like the Atlanta Hawks or Golden State Warriors were doing, he would intentionally slow the game similar to Quinn Snyder (something that Austin Carr really hates, he brings up the pace of the game once every five minutes during a cast). By doing this, Blatt imagined capitalizing on the faster team’s excess offensive workload, and countering by having his players expend extra energy towards precision shots during their limited offensive possessions. Since posessions would be limited, Griffin stacked the team with three point shooting. James Jones and Mike Miller carved a role in the NBA as three point specialists, Kevin Love’s game was unique due to his ability to space the floor as a forward, as Shawn Marion aged, he transitioned his game into a low contact midrange scorers pattern, even some of Cleveland’s home-grown talent such as Matthew Dellavedova showed promise as a strong 3 and D guy. Griffin started creating a cast of shooters around LeBron far before anyone in the NBA media noticed it. Now if the year was 2011 and you told me Cleveland was rolling out a lineup of Rookie Point phenome Kyrie Irving, third year dominant 30/20 Kevin Love, LeBron James, sharpshooter Mike Miller, Rookie Tristan Thompson and off the bench was not in their primes but still excellent Shawn Marion and James Jones, I’d tell you there wasn’t a chance in hell those guys could lose. But this team wasn’t made in 2011. Forty games into the year, those fringe all-star weekend invitees (Mike and Jones would be three point competition guys, but Marion, he could have been an all-star if it wasn’t for sharing 2011 minutes with Dirk) showed their age. The starters were regularly playing 40+ minutes a game, and Cleveland, the so called super team, fell below .500 with a record of 19-20. A change wouldn’t just help the team, it was necessary if they needed to survive. Here once again we turn to Griffin, someone who had a vision and would do anything to play it out. His two trades’ midway through the 2014-2015 season would become defining in cementing himself as one of the best General Managers in the league. Griffin identified two issues, first, his starting shooting guard Dion Waiters wasn’t responding to James’ past first message the same way Irving did. After a no-assist game, James chewed Irving out, telling him never to do such a thing again. Waiters on the other hand still embraced iso-ball, and played as if he was the first option on a team where clearly he was fourth. Secondly Griffin, and stop me if you’ve heard this one before, was looking to add a defensive true center to the roster to help block up the paint. Griffin managed to plug both of these holes, as well as add roster depth at very little expense, a talent that would continue throughout his Cavs tenure. The original goal was just Shumpert. 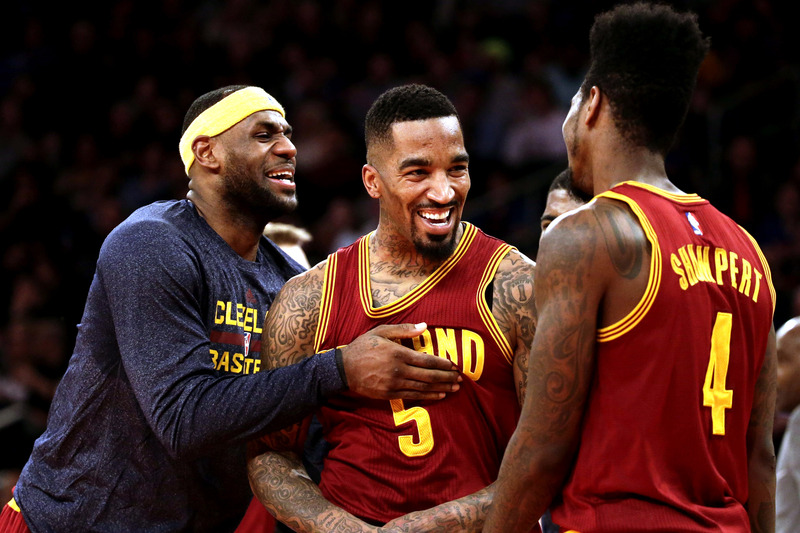 Cleveland saw the budding three and D guard as the long-term solution at shooting guard. Instead of fitting another scoring guard in with Kyrie Irving and co, Griffin recognized a need to add complementary pieces that elevated single parts of the squad. In Shumpert’s case, he brought a defensive tenacity without many required touches on the offensive end. His shooting touch was just hot enough to require a defender, though getting low usage on the offensive end wouldn’t inhibit his talents. J.R. Smith, however, was something Griffin saw and no one else did. I remember one of my friends describing J.R. Smith as an older Dion Waiters with less upside. Phil Jackson added him to the trade (along with a first round pick that would eventually be used on Timofey Mozgov) to shed salary and a contract they didn’t want. Apparently a change of scenery was all Smith needed, because he ended up filling the sharpshooter role Cleveland wanted with Mike Miller. Additionally Cleveland went from a three man guard rotation (Irving, Delly, Waiters) two of which needed the ball in their hands to a four-man guard rotation with two utility players (Delly, Shumpert) a sharpshooting starter in Smith and Kyrie Irving, initiator. The Mozgov trade only further exemplified Cleveland’s knack for finding diamonds in the rough. It wasn’t that Mozgov’s time on the Knicks or the Nuggets were bad, it’s just that he wasn’t exemplary. Something you have to understand when evaluating Cleveland trade rumors, big names for the most part are never swapped. Blockbusters such as the Denver/New York swap for Melo or Demarcus Cousins for … some rookie role players? rarely happen. Rather when looking for trades, often it’s the smaller names that make the largest difference for a contender. In Cleveland’s case, acquiring Mozgov added substantial versatility to their front court, literally plugged a hole in their defense and proved once again Griffin hand an eye for auxiliary pieces. There is one place where Griffin does show some flaws, and that’s picking up past their prime big men off the waiver wire. Most people will recall Andrew Bogut’s 52 seconds of fame as a Cavalier, but do you remember the 17 legendary games Kendrick Perkins played as a Cavalier. In short they weren’t glorious, but we did get a great highlight when Perkins backhanded Jae Crowder. Cleveland players were mad when Perkins wasn’t resigned the next year, which arguably implies he did have impact that the casual fan (or anyone that doesn’t reside within the locker room for that matter). By the start of the 2015-2016 season, Griffin created a roster that was two games and two stars away from winning the NBA title. Needless to say he’d built his core. The starting five of Irving, Smith, James, Love and Thompson clearly worked, and despite clamors for additional depth at positions, Cleveland was relatively well built. At this point, Griffin was just looking to add a few complementary pieces and fill a role or two. Griffin’s past trades relied on at value swaps (to say what those teams acquired in exchange for those players were roughly equal), chasing players that were available and paying near premium for their services. Mozgov cost two first round picks, one that was traded for two time “Shaqtin’ a Fool” MVP, JaVale McGee and then Memphis’ pick this year. Smith and Shumpert cost Cleveland Dion Waiters, though acquiring Smith was seen at the time as a collateral move on Cleveland’s part. Griffin’s final roster tweaks instead focused on opportunistic signings and trades, making moves based on players that recently became available due to other situations around the league. The first of these players would be Richard Jefferson. I love the story around how Cleveland acquired RJ. There involves an angry Marc Cuban driving around LA looking for DeAndre Jordan’s house, DeAndre Jordan reportedly signing with a new team every thirty minutes, and Doc River’s sleeping in a tent. I genuinely can’t express how humorous that three hour period of hitting refresh on r/NBA was. I personally encourage everyone to go read this story on their own, but just in quick summary: DJ made a verbal agreement with Dallas, then the Clippers wanted him to stay, so Doc, Blake and CP3 all came over and had a sleepover party at DJ’s house, setting up tents in his back yard and that next morning DJ resigned with the Clips. What’s important for Cleveland was that Dallas suddenly let their free agent veterans re-enter the market. Credit to Griffin, knowing he needed a replacement for Shawn Marion to backup LeBron James, within hours went from looking at a not-so encouraging list to signing former fringe all-star Richard Jefferson to a role. The Channing Frye trade was a second case of opportunistic play. Entering the 2015-2016 season, Orlando didn’t totally know what they wanted. At home they were killers, putting up a 7-1 home record in November, and a more modest but still positive 5-3 in December. Away, however, Orlando couldn’t steal a win if their lives depended on it. Orlando faced a choice, blow up their veteran presence and restart a rebuild, or add pieces to compete for the 8th seed. After an unsuccessful January, the decision was clear, and the fire sale began. Cleveland jumped on the opportunity, immediately adding Frye, a player Griffin wanted since taking over as general manager in 2014. I just want to quickly point out I called this trade months before it happened, pretty much my life’s only notable accomplishment. I personally liked the Dahntay Jones signing, but there isn’t much to say about it. Unlike most signings, Jones was almost exclusively signed to be an enforcer. He hit Draymond once, I honestly can’t really find any other reason why we signed him besides getting under Draymond’s skin. Turns out just adding more auxiliary pieces (and you know, having more than 4 members of your team healthy in the finals) was all Cleveland needed. And while James can be credited for doing the heavy lifting to win that finals, don’t discount Griffin’s ability to morph a lottery team into a champion in under two years. Kay Felder’s acquisition is one of foresight. His timeline is nowhere near that of the current nucleus, but that doesn’t mean he doesn’t make sense. Felder was well regarded as one of the sleepers in the NBA draft. He got consideration during the Rookie AMA with Jaylin Brown referring to Felder as the hardest to guard during the Summer League. Felder might not be part of Cleveland’s plan, but his regular 30 point a night games in the G-League ups his value, making him potential trade bait to further improve this team. Griffin’s other offseason moves should receive some note, even if they are almost unnoticed by the casual NBA fan. Matthew Dellavedova was clearly leaving, he could get paid far more than Cleveland was willing to offer. Instead of just letting him walk, however, Griffin made a TPE and a sign and trade which ended up becoming Mike Dunleavy. Griffin also found a few projects such as Eric Moreland that are under the radar performing quite well (Moreland had 20 rebounds in his last G-League game). DeAndre Liggins quietly plays excellent defence, and served well as a reserve role during the injury plagued early season. Griffin’s magnum opus, however, is the Kyle Korver trade. If it wasn’t for the straight fleecing that the New Orleans Pelicans were able to pull off, Cleveland would far and away win the trade of the year. Atlanta got virtually nothing, a first round pick that in 2019 will likely land somewhere between 22-30 and an aging Mike Dunleavy. Cleveland on the other hand didn’t just get sharpshooter Kyle Korver, but additionally unloaded Mo William’s deadweight contract, freeing up space that would later become Deron William’s contract. Griffin isolated one of the best systemic fits in the NBA, convinced his current team to start a rebuild they wouldn’t actually commit too, and trade virtually nothing in acquiring said piece. The scope of such a trade is nearly highway robbery for what Cleveland ended up acquiring. 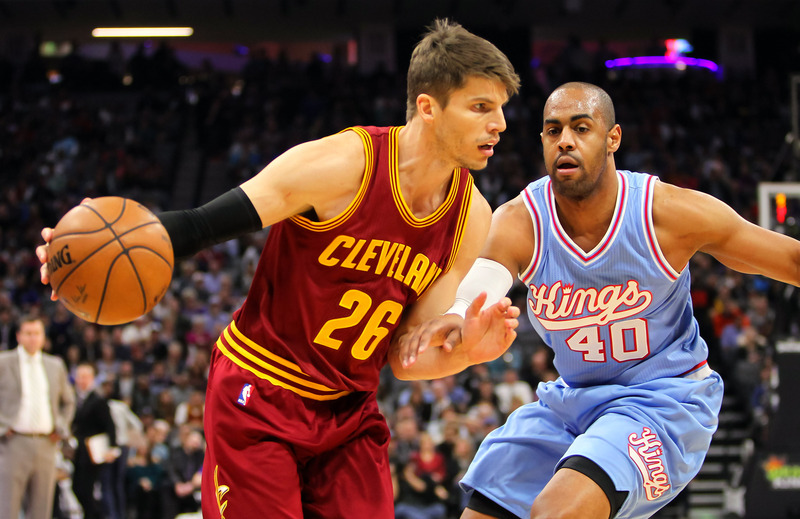 Furthermore, Korver has stated intent regarding remaining with the Cavaliers past the end of his current contract. Griffin hit a home run with this one. I think I should quickly make note of the waiver wire pickups. Cleveland did by far get the best additions off the waiver wire, but that was far more a product of top tier veterans desire to ring chase. Deron Williams wasn’t going to take an offer from Utah over Cleveland just to finish out a season. Andrew Bogut wasn’t sticking with an already Center packed, non-playoff 76ers roster. Larry Sanders openly admits he’d only sign with Cleveland. I will shower praise on Griffin for days, but this time he doesn’t really win any points outside of being the GM of the League’s best team. If there’s only one thing you take from this piece, it’s that Griffin is good at his job. When you’re in the presence of the best player in the NBA, often times your own accomplishments are credited to James, but don’t assume that Head Coach LeBron James, General Manager LeBron James, Best Player in the World LeBron James makes every decision, negotiates every deal, and builds every team. Griffin plays a critical role in making James look better, and while often he is relegated to the shadows, every so often it’s only right to give proper credit where credit is due.